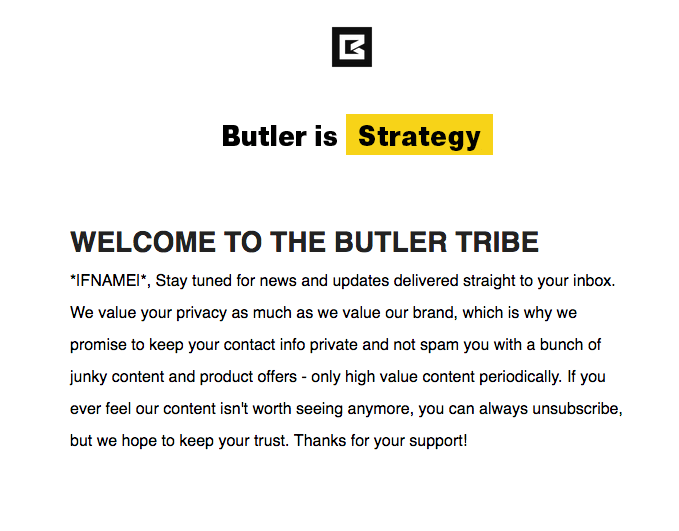 Alright, you now know HOW to send marketing emails. You know WHO you’re going to send them to. Finally, we can talk about WHAT sorts of things you’ll send your audience – to increase brand awareness and/or make sales. We all know businesses who have done email marketing wrong. Those businesses treat their audience’s inboxes like dumpsters, sending any and all sorts of emails in the hopes SOMEBODY will click just one. Those businesses prefer email quantity over quality. You don’t want to be like those businesses – there’s no faster way to shed subscribers from your list. As you start email marketing, you might be tempted to overdo it and send your list daily emails that offer “content” but not value. Do not send these sorts of junk emails, as it shows you take your ability to reach someone’s inbox for granted. Instead, put some care into crafting content that your audience will not only read, but be delighted to receive. Below, we’ll lay out some simple rules and processes for doing just that. Most beginning email marketers get lost in the weeds of email formatting and design (before even thinking about content). 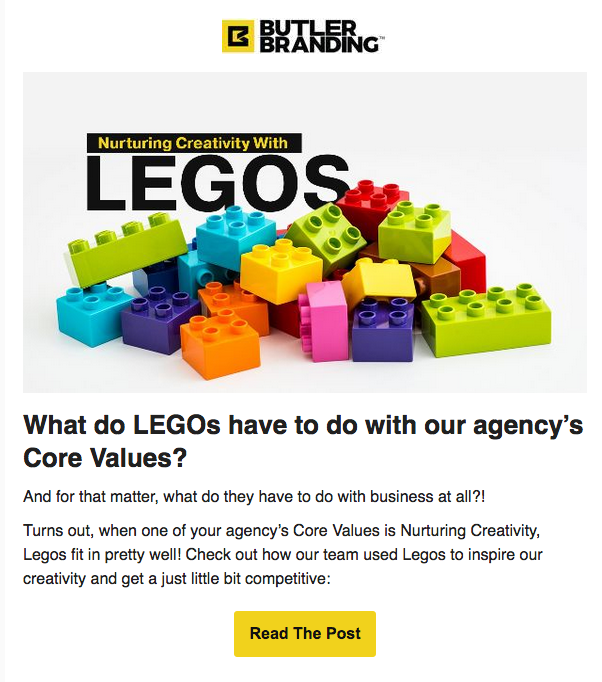 They think their emails need to look “unique” or visually distinct in order to capture their audience’s attention. A catchy title and associated image, based on your content. Some content and an associated Call-to-Action. The above email was simple. It was simple to concept, simple to create, and most importantly, simple for our audience to read and take action on. And many of them did, clicking through to read our full post about LEGOs, businesses, and creativity. Welcoming new subscribers to your list. Automatically blasting out blog updates. Sending monthly newsletters or coupons. Wishing your followers a Happy Birthday. So don’t get hung up on design, and do let your audience know what they’re in for as soon as they sign up for your list. After you’ve done that, you can start sending the high-quality content that your audience expects. Thinking of content, topics, and ideas related to your brand or business. This could be anything from “The Top 5 Ways to Identify High-Quality Real Estate” to a special, subscribers-only coupon code to a monthly newsletter highlighting your brand’s efforts and achievements. Writing out what you’d like to say on each topic. Gathering associated images and other resources as needed. Putting your emails together within your email marketing system (and scheduling them to send automatically when possible). That means sending content that is targeted, useful, and appropriate, and it means sending it on a schedule that won’t overwhelm your audience. If you’re a financial institution helping customers manage stocks, you might be able to send daily email updates without annoying your amateur stock traders. But if you’re a bakery sending pictures of new concoctions, once a day emails might be overkill.